The millennials, or more accurately Generation Y, are a phenomenon having a major impact on retail and real estate markets thanks to their consumer behaviour. 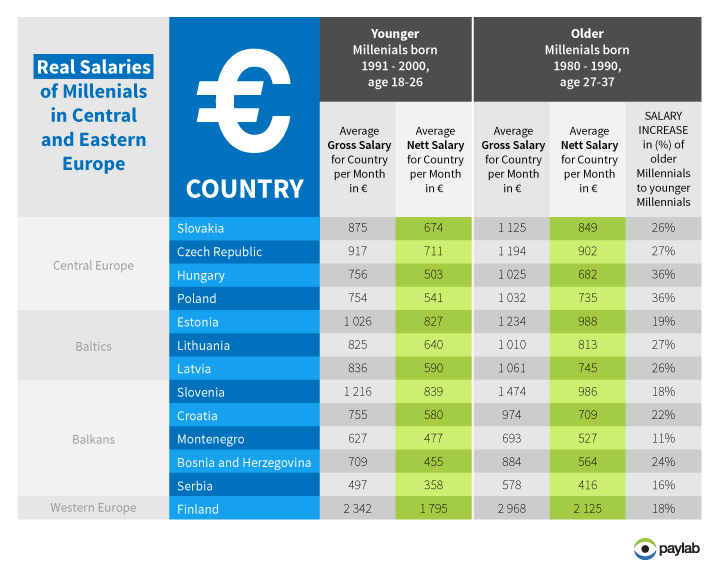 The international Paylab salary portal decided to take a closer look at the real purchasing power of the current employed generation of millennials in the countries of Central Europe, the Baltics and the Balkans, where it operates the largest on-line portals dedicated to salary information. People born after 1980 have become a strategic target group for many marketing firms with major clients. This generation has largely lived in an open and free world since they were very young and, quite naturally, they take full advantage of all the benefits afforded by freedom of thought and democracy. They grow up with information technologies as an integral part of their lives. This is the Internet generation, spending hours a day on-line, surrounded by an onslaught of information and the possessing the knowledge that most anything can be found on-line, causing them see the on-line world as a primary source of information, including consumer behaviour. Compared to the generation of millennials in Western Europe, millennials in the CEE region are not much different in terms of their use of modern technology, but they find leaving the nest and moving into their own housing to be much more complicated given the local conditions. In terms of income, there is a visible difference in the pay of millennials who are entering or just recently joined the labour market and those with several years of work experience. Realistically, members of the latter group have at least a 25% more spending money on their accounts. Read more about the differences in financial behaviour between young adults born in the 80s and 90s in our Paylab Blog. How much money do millennials in Central Europe, the Baltics and the Balkans have to spend? In analysing all the incomes of millennials born in Central and Eastern Europe and examining every country in terms of real salaries across all regions, including the capital cities, Paylab determined that young people do not have more than €1,000 net to spend on average. There is a visible increase of around a quarter on average when comparing millennials born in the 90s and 80s. The greatest increase in pay involves positions considered low to middle management; here millennials can expect career salary growth of up to 40 percent in the Visegrad countries (Poland, Czech Republic, Hungary and Slovakia), 38 percent in the Balkans and 23 percent in the Baltics. 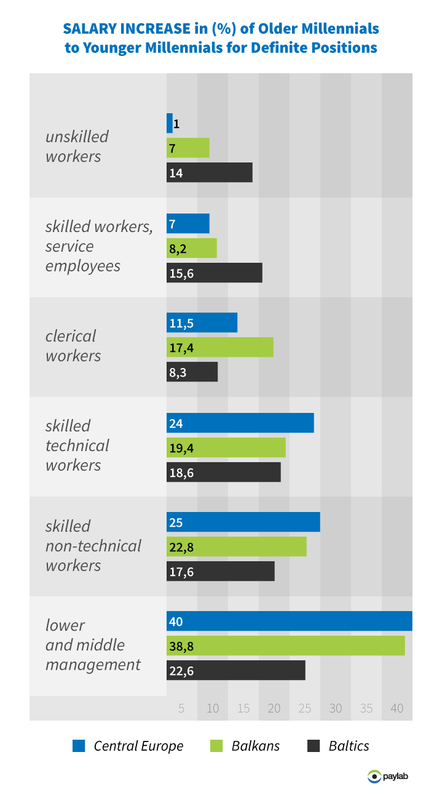 An increase in regular salaries is also visible in qualified technical and non-technical positions, which show salary growth rates of 18 percent in the Baltics and up to 25 percent in Central Europe. There is no major difference in the salaries of younger and older generations of millennials in administrative positions. Paylab only recorded a significant increase in the Balkans for these positions, up to 17 percent, but it was only around a tenth in Central Europe and the Baltics. The lowest salary growth is in auxiliary staff, qualified labourers and service workers, where salary growth is lower and does not exceed 8 percent. The same cannot be said about the Baltics, where a 14 to 16 percent increase is observed in these positions. More than 480,000 employed persons compare their salaries on the international Paylab portal every year. Compare your salary with others. The region of Central and Eastern Europe is typical in that a relatively large portion of millennials continue to live with their parents, according to Eurostat. As many as 6 of 10 young people aged 18 to 34 live in a shared household with their parents. This problem is more acute in Croatia, Serbia and Slovakia, where 7 of 10 young adults live with their parents in this age range. This is related to delaying parenthood, and a lack of affordable housing - such as rent-controlled public flats - is a major contributing factor. Earnings are simply not enough given the high prices of real estate. Young adults only have a realistic chance at getting their own place when a couple come together to secure a mortgage and their household is financed by two incomes. In Slovakia alone, as an example, the price per square meter (m²) is around €1,500 for flats, while in its capital, where most jobs are concentrated, this rises to up to €2,100, which is more than 2.5 times the average monthly net income of millennials in Slovakia. The price per square metre of space in Croatia hovers around €2,000, which is three times the average net monthly salary of millennials, i.e. thirtysomethings, in the country. In Croatia, also due to economy crisis, a lot of young people lost their jobs and also the opportunities to advance in early ages of their career. There is also the high youth unemployment rate among young millenials. The typical age at which young people leave the nest and strike out on their own in Central and Eastern Europe is 28. This is the age that young millennials gain financial independence. The earliest millennials to leave the nest are in Estonia, at age 23, and in Czech Republic, at age 26. Those remaining with their parents for the longest are Croats and Slovaks, who leave home at age 31 on average. Men are more likely to hold off on giving up the comforts of home in general. They leave home roughly two years later than their female counterparts in the region. Their lifestyle is a tremendous contrast to Western Europe, where young people leave their parents much earlier. As an example, in Finland they leave home at age 22 on average. Read more about the differences in financial behaviour between young adults born in the 80s and 90s in our Paylab Blog. Paylab is an international salary survey platform that collects information on the incomes and bonuses of employees for more than 500 job positions. Paylab uses a unique methodology for collecting data with a three-phase control and over eight years' experience. Visitors to the Paylab website or partner sites in their country can easily and anonymously complete an online questionnaire on their salary, and compare their income with the national average for that position. The system always uses current data for the last 12 months.